Our armoring process is designed to give you the most reliable protection without compromising the integrity or appearance of the vehicle. For vehicles you don't want attracting attention, our finished armor is so discreet that, to a casual observer, the car doesn't look any different than it did before armoring. After dismantling the interior of the vehicle to expose the frame, we start adding armor. The floor, ceiling and doors are all measured and fitted with composite and/or steel armor to protect the passenger compartment from metal fragments and projectiles. For more information about the levels of protection we offer, visit our Materials and Specifications page. Firewall protection is placed behind the steering column, console, all wiring, heater and air-conditioning. The armor templates contour to all areas of the firewall from the overlap of front windshield frame to the two board. All surfaces are welded solid, ground smooth, and then painted. Four gun-ports are included in a standard quote for armored vehicles, and a larger number can be installed depending on your desired level of protection. Custom designed by Armortek, these gun ports are not visible from the exterior of the vehicle. Gun port doors are fully armored and spring loaded for automatic closure. Standard window glass is replaced with a bullet-resistant glass composite. Each piece is curved to fit into the window openings with a precision that results in a more reliable window and does not put additional strain on the glass. Standard windows in armored cars are not operational. With Armortek, you do have the option to up-grade windows so they can roll up and down. This lets the windows open between three and five inches. We install armor plate around the battery to protect it from gunfire and electrical shorts. For certain vehicles, a supplemental battery is installed to handle the additional load necessary to power optional systems. The vehicle's gas tank is filled with foam of an open-cell design that prevents the accumulation of fumes. The exterior of the fuel tank is encapsulated in a self sealing coating that prevents leakage of fuel if the tank is penetrated by a bullet. 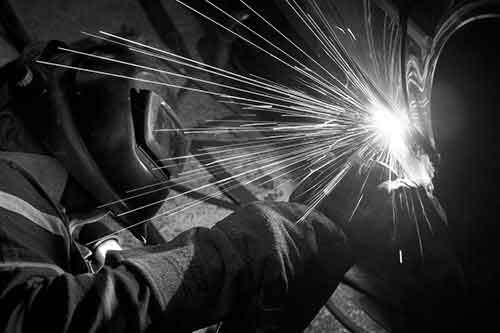 We up-grade the suspension of all vehicles we work on to accommodate the extra weight of the armor. If necessary, brakes are upgraded as well. Optional run-flat inserts specifically designed for your wheel provide continued mobility even if your tiers are “blown out.” Tire pressure and balancing for vehicles with run-flat tires is the same as with a standard tire. The run-flat inserts can be re-used when tires are replaced. You have the option to add enhanced protection features to your vehicle, such as attacker deterrents and emergency escape systems. We add these additional systems during the armoring process. For more information, visit our Enhanced Protection Upgrades page. Finally, we replace the interior of the vehicle with careful attention to maintaining the original appearance. By the time we're finished armoring, both the interior and exterior of your vehicle look almost exactly as they did before.